Sekumpul Waterfall trekking starts with pick up from the hotel at 08.00. If you are in south Bali it takes about 3 hours drive to reach Sekumpul waterfall and from Ubud, it takes 2 hours. We will pass the Bratan Lake and Twin Lake which we will visit after trekking. 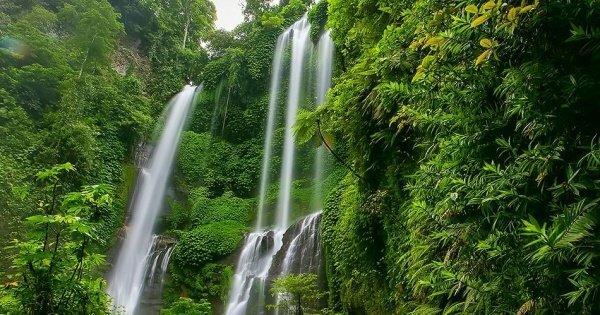 At Sekumpul, you will be guided by a local tour guide to pass through the tropical forest to the waterfall Sekumpul. Locations that are in high areas have frequent rain and is green all year. We will pass a declining staircase, from this place you can see a waterfall gathered from the top of the hill and it is not too far away to reach. There is a rest area to take a break while looking at the waterfall Sekumpul. Up in the waterfall, you will experience a different world, calmness, the sound of running water and the rumbling waterfall. Enjoy a beautiful view of unspoiled nature and the natural waterfalls. Natural spring water flows directly into the Sekumpul waterfall. Do not forget to take your time to take pictures or just swim here. But you have to be careful, do not be directly under the waterfall because it is very dangerous, many rocks and twigs of trees that fall from the top can hurt you. After completion of trekking in Sekumpul waterfall, we will invite you to see the Twin Lake from the top of the hill. From here you will see the beauty of these two lakes. From the road to this place, you can see the wild monkeys that are around. Then we will invite you to lunch at Bedugul, a place to eat that presents the view of the Lake Bratan. After the meal, we will take you to visit Bratan Temple in the middle lake and if there is enough time, we will take you to see rice terrace in Pacung village and the beautiful rice field scenery because this location is bordered directly in the northern part of Jatiluwih village which is also famous for rice terrace. Take your time to take pictures here, we will choose the best spot.